Let me stop you right there: yes. Yes I have. I have considered that possibility; I have thought about that thing. What’s more, I’ve probably thought of the next 10 things you’re going to throw out at me, too. For a long time, I liked this fact. I liked what it said about me: that I thought things through; that I was logical; that I followed rational thought above all else. As an academically-minded person, it made sense: of course I was a thinker! Why wouldn’t you be? Because here’s what no one thinks of when they start listing the pros of being a strong “T,” rather than an “S” (sensing): you can’t stop it. Imagine that you are standing in line, waiting to buy yourself some lunch. When you walked into the restaurant, you had an idea of what you wanted to buy–a big French dip roast beef sandwich just sounded like perfection. As you stand in line, though, you see a sign for the special, a turkey sandwich on whole wheat bread with sprouts and avocado. Instantly, your brain starts working. A French dip does sound good, and that is what you came in for, but then you do like turkey, too, and you’ve read recently about the amazing health benefits of the avocado. You check prices: the French dip is cheaper. But it’s on white bread with cheese, and then what about all those studies you’ve read on how beef is just a heart attack waiting to happen? But then that other article said good beef is actually good for you, and maybe this is good beef? 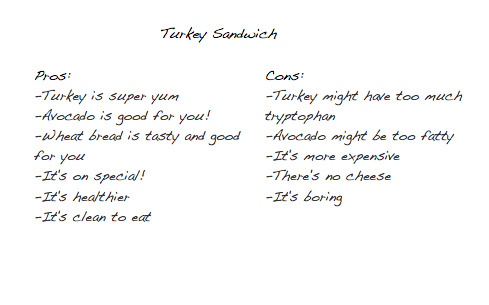 The turkey is on whole wheat bread, which you know is good for you, and tastes better, too, and it has no cheese, which is bad for you. But the turkey might have more tryptophan in it; you can’t afford to fall asleep at work! And aren’t avocados pretty fatty, too? But it’s on special! By the time you reach the register, your mind is whirling with a million little factors which may not even be relevant to your sandwich choice at all, but which call your entire life’s purpose into question. 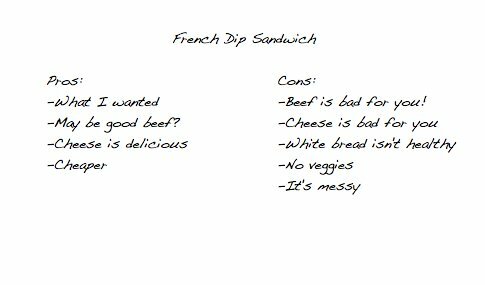 Will the French dip end up dripping on my clothes? Will my friends judge me for eating meat? How important should price be to me relative to deliciousness? Do I care about my diet? Should I care about my diet? Am I too fat? Am I too skinny? Am I overthinking this decision??? If you’re an “S,” you are probably laughing right about now. For you, I imagine, the choice would be much, much simpler. You came in wanting a French dip; you walk out with a French dip, unless something about the turkey sandwich piques your interest enough for it to supplant your original sense of what sounded good. Easy-peasy. Just know: your “T” friends are in a minefield of thought where even the simplest of decisions can turn into an impossibility with the addition of just one simple special. Just imagine what the bigger, more complicated decisions look like. Let’s just say they’re not pretty. The day college decisions were due for me, my parents took me out of school for the day–because I hadn’t made a decision yet and I needed a full day to process and, eventually, choose one. Choosing classes always involved a massive chart of times I had free, classes I needed, classes I wanted, and how many hours I could reasonably dedicate to classes and work. Choosing a country to apply for for Fulbright was a four-month task that involved reading each and every country description and creating detailed pro and con lists for the ones I had shortlisted, which got expanded with each new cut. Last summer was a quagmire of near-depression as I chose between Seattle and Redding. And those are all this-or-that choices. Pull in some unknown variables, like, say, other human beings, and my brain kicks into a high gear, spinning at a NASCAR-esque speed with no traction whatsoever. Of course, when others hear you’re trying to make a decision, they try to talk you through it. And it can, in theory, be helpful. But when your brain has already identified each and every contingency of each and every possibility of each and every choice, talking through it all, again, does absolutely nothing to help. Know what does help? Getting out of my head. Taking a break; watching a comedy; reading a book; getting coffee with a friend; writing a blog post. Being in the present. Making a conscious choice to STOP thinking, and to trust what you’re sensing and feeling and forget about thought–even for a moment. Because any personality trait, taken to the extreme, becomes a negative trait. And every personality, when worked on, comes closer to balance. Getting out of my head is a matter of great importance, not just for my decision making, but for my happiness. So, just a word of encouragement to my fellow “Ts”: turn it off for a bit. Get out of your head. It’s getting musty in there, and the gears are starting to spark. Let’s shut this whole thing down, and step out for a bit. It’ll all be there when you get back. This entry was posted in Life, Personal, Personality and tagged balance, choice, decisions, differences, Myers-Briggs, personality, personality tests, S, sensing, T, thinking by bekahgraham. Bookmark the permalink.